Motorcycle riders involved in a crash caused by another driver may be entitled to compensation for their injuries. In order to collect, an injured motorcyclist must prove the other driver neglected to obey the rules of the road. 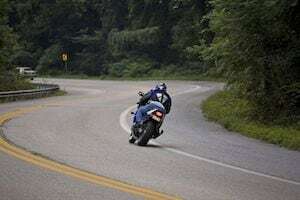 The process is similar to that of a car accident claim, with one notable difference - motorcyclists are more likely to be accused of contributing to the cause of the accident due to a widespread belief that motorcycles are inherently dangerous. John B. Kenison, Jr. understands the unfair bias injured motorcyclists face. As a motorcycle accidents lawyer in Manchester, NH, he takes on big insurance companies and their defense attorneys. Contact Mr. Kenison to discuss how he can help obtain justice on your behalf. In the vast majority of collisions between automobiles and motorcycles, automobile drivers are to blame. Motorcyclists face bias even though they have the same rights to the road as everyone else. A motorcycle accidents lawyer can help riders secure compensation for injuries sustained in motorcycle accidents so they can focus on the recovery process and resuming a normal life. Motorcycles are smaller than cars. While this basic fact is unlikely to change, motorcyclists and advocacy organizations are doing their best to address the issue. Riding in groups is one example. Installing loud tailpipes - and educating the public about their safety benefits - is another example. Automobiles have blind spots capable of obscuring a motorcycle. Because of their size, motorcycles are more susceptible to blind spots. Consider an automobile’s A-pillar. This is the portion of the frame that runs vertically between the windshield and front window. At an intersection, an automobile’s A-pillar (and side-view mirror) can completely obscure a motorcycle approaching on the cross street. Texting while driving, DWI (Driving While Intoxicated), and other types of distracted driving are prevalent. Anything that averts an automobile driver’s eyes or slows down the driver’s reaction time will increase the risk of an accident. This is especially true when dealing with motorcycles, since visibility is already an issue. Drivers do not anticipate motorcycles on the road because they are less common than automobiles. Drivers have a greater awareness of the types of vehicles they see the most. If motorcycles and scooters outnumbered cars, as they do on city streets in some parts of the world, drivers would be much more alert to their presence. Driver training courses do not sufficiently emphasize motorcycle awareness. New drivers are responsible for causing more than their share of traffic accidents. Licensing tests and driver education programs need to better address motorcycle awareness. In some cases, product liability may cause or contribute to your accident. Mr. Kenison is an experienced product liability lawyer who can make this determination. What happens if a motorcycle rider is partially at fault in a multi-vehicle accident? Mr. Kenison has successfully represented injury victims whose own conduct contributed to the accident. As long as the combined negligence of the other parties makes them mostly (51% or more) to blame for what happened, the victim can still recover damages. Also keep in mind that an investigation by Kenison Law Office may reveal that our client was not to blame, despite the conclusions of a police officer or insurance adjuster. In a typical rear-end collision between automobiles, the driver in front receives some protection from the rear chassis of the driver’s car. In fact, the entire back half of the car acts as a buffer between the point of impact and the driver’s body. This “crumple zone” does not exist for a motorcycle rider. Lacerations and hard injuries like broken bones are far more common in motorcycle accidents as a result. Traumatic brain injuries are also a major concern, irrespective of whether the rider was wearing a helmet. Motorcyclists have the same right to the road as everyone else. If you were recently injured, you may not be in a position to fight back against an unreasonable insurance company. Tell us about your motorcycle accident. We are ready to stand up for your rights.